Where should you go 2016? We've traveled the globe and done all the research to discover the best luxury travel trends and cruise destinations of the year. These are the hottest travel spots for 2016! Conde Nast Traveler is calling 2016 “The Year of Australia”, and we’re inclined to agree. The eclectic food scene in Melbourne is world-renowned, and the country is home to some of the best wine and craft beer in the world. Venture down to Tasmania and taste award-winning whiskies. 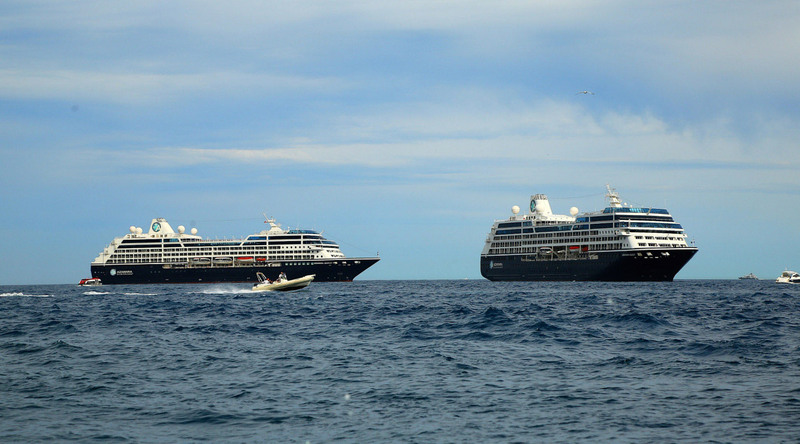 Azamara Quest kicked off 2016 in Australia and has several voyages planned in January and February. Japan was ranked at number two on Lonely Planet’s list of “Best in Travel” for 2016, and we think it certainly deserves a place on your bucket list. Osaka is often referred to as the culinary capital of Japan. A popular Japanese saying proclaims that people from Kyoto spend their money on clothes, people from Kobe spend their money on shoes, and people from Osaka spend their money on food. Don't miss Osaka's world-renowned sushi, tasty udon and Kobe beef. Try takoyaki (pictured below), fried balls filled with diced octopus, tempura, green onion and pickled ginger. Tako Tamago - baby octopus stuffed with quail eggs - is a popular street food and another must-try dish. Since most tourists flock to Tokyo or Kyoto, most Osaka restaurants cater to locals and visitors will get a more authentic experience. Talk about Destination Immersion® experiences! This March 2016 voyage begins with an overnight stay in Osaka and also includes Hiroshima as a port-of-call. Expect Ireland to see a surge in tourism thanks to the island of Skellig Michael being featured in a little film called Star Wars: The Force Awakens. For those looking to soak up as much of this magical country as possible, we have the perfect itinerary. This July voyage embarks from Dublin, perfect for those who’d like to do a land tour prior to their cruise. In addition to calling on ports in England, Wales, Scotland and Isle of Man, this voyage calls on Belfast, Northern Ireland, Waterford, and Cork. Kotor offers the quaint charm and incredible food of your favorite European destinations, but without the crowds. It’s also one of the most photogenic cities we cruise to. If you’re up for the challenge, climb the 1,350 steps to the top of the town walls – the views are spectacular. This September 2016 itinerary includes a late-night stay in Kotor. Costa Rica is Central America's most popular travel destination, but Panama is quickly climbing up the ranks. Visit this pristine, tropical wonderland before everyone else has. We're going to end 2016 on a high note with this December cruise, which will take guests through the astounding Panama Canal and on to Colon. Colon is an ideal destination for birdwatching, snorkeling, and lounging on the beach! Can’t wait until December? That’s OK. You can explore Panama right now from the comfort of your home! Just visit azamara3di.com to watch our 3D videos! There’s no bad year to visit Rome, the Eternal City. But 2016 will be particularly special. Pope Francis has named 2016 “The Year of Mercy”, which means pilgrims will flock to The Vatican all year long. The Trevi Fountain has reopened after a restoration (thanks to sponsorship from fashion house Fendi) and a restoration of the Spanish Steps (thanks to sponsorship from jeweler Bulgari) is due for completion this Spring. This seven-night voyage sails round-trip from Civitavecchia in the fall, providing an opportunity for pre or post-cruise explorations in Rome during a beautiful time of year. Like Panama, Sri Lanka has a growing tourism industry. Visit this pristine paradise before everyone else does! Sri Lanka is a small island, but it boasts eight UNESCO Heritage Sites, an elephant orphanage, and acres upon acres of lush tropical forests. Cruise to Sri Lanka in either April or November. Thanks to hotel growth and a booming food and art scene, Miami is a travel hotspot for 2016. It’s also a popular cruise embarkation port. Spend a few days enjoying the city’s shopping and nightlife before crossing the Atlantic with us! Why cruise to Sicily? How about UNESCO World Heritage Sites, wine grown in volcanic soil enriched by minerals from Mount Etna, and incredible cuisine featuring locally-grown pistachios, olives, citrus fruits, tomatoes and more. Explore the beaches, ancient ruins and culture of Sicily in August 2016. This itinerary includes both Trapani and Siracusa. Scotland is celebrating the Year of Innovation, Architecture and Design in 2016. Events will take place around the country, celebrating everything from art and fashion to groundbreaking science and iconic buildings. Visit castles, distilleries, museums and pubs during this British Isles cruise in July, which calls on Edinburgh, Kirkwall, and Portree. Dubai is unique; there is nowhere else like it on the planet. It's ever-changing, fast-paced and over-the-top. In October 2016, we're going on a special Le Club Voyage cruise that begins with an overnight stay in Dubai. Le Club Voyage members will receive exclusive perks and special experiences, making it the perfect time to explore the Arabian Gulf! Spend an exciting night experiencing one of the hottest travel destinations in the world, and then move on to some lesser-known, but just as fascinating ports. Your floating boutique hotel, the newly refurbished Azamara Journey, will let you experience this destination in style. Where will we take you in 2016? With Azamara, the options are practically endless. We have 65 voyages planned for 2016, calling on 204 ports in 70 different countries. Wherever you decide to go, we know you'll love it!